Textile manufactured to provide high performance thermal protection. Exclusive Précontraint® FERRARI production method. This unique technology gives the textile exceptional qualities in terms of strength and service life. 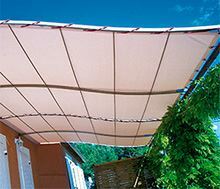 • Composed of a weft of high tensile strength polyester threads and a twin-sided PVC coating. • Composed of a polyester thread weft and a twin face PVC coating. 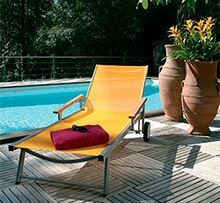 The widest range on the market, excellent heat protection and mechanical strength. This textile is available in a choice of 48 twin-sided colours, 5 widths up to 285 cm for large size textiles. 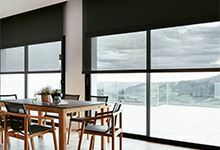 • Very good glare control thanks to its diagonal satin weave, while optimising natural light. 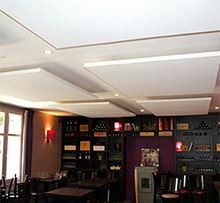 • Economic: 5 widths to optimise the manufacture of fabric panels. • Health / Safety: Meets the requirements of establishments open to the public. 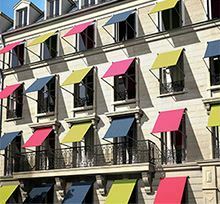 Ideal for awnings, vertical blinds, baskets, small structures. • High density polyethylene thread (HDPE), woven and UV treated. • Thermal adhesive marking: printing on acrylic or micro-perforated valances. 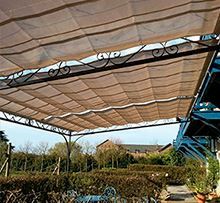 Our pergola textiles are manufactured in PVC 502, STAM 6002, SOLTIS 96, 92, W96, SUNWORKER CRISTAL, STRETCH and ACRYLIC. • Rectangular or shaped production with trim or seam + eyelets in the upper part + eyelets on the 3 other sides to thread tensioners onto the framework. • Velcro attachments on the framework as an option to prevent the textile from lifting and flapping. • Lacing tensioner and aluminium caravan rail. 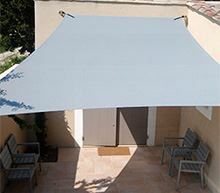 • Roof lining with trims or sheaths. • Interchangeable panel roof lining. 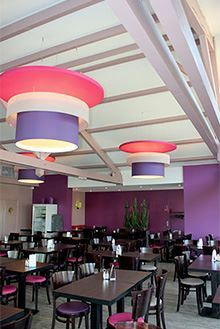 High acoustic performance comfort textile, easy to assemble and remove, suitable for new builds and refurbishments. • Very consistent acoustic behaviour from basses to trebles. • A suitable response to the comfort requirements of buildings open to the public. 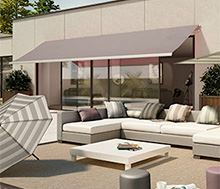 • Directly inspired by modern architectural trends. • Customisable using digital printing. • High mechanical strength against warping and shocks. • Insertion of technical elements without damaging the material.